If it’s fall, then the IQA Quilt Festival in Houston is right around the corner. I love the Houston show. (Question: Why do we refer to quilt shows by the location rather than the official show name? Discuss.) The Houston show has more quilts, more vendors, and more visitors than any other show I’ve ever attended. Think really big. In 2010, attendance was over 60,000 people. If you’re planning to be there, I’d love to see you! Here’s where you can find me. Thursday, October 31, 9am-noon, class number 446. This is my second year to teach this class at the Houston show, but I’ve taught it many times for guilds and at Artistic Artifacts, my local fiber arts shop. I really like Tsukineko inks and the subtle color they can add to labels and printed photographs. What I LOVE about these inks is how much fun it can be to color black-and-white commercial fabrics. I like to start with a very light value and then add more ink to achieve darker color values. 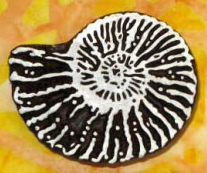 The inks can be heat set and then more layers added. Thursday, October 31, 2-5pm, class number 484. I taught this class last year, too! Many of the quilts I make are memory or celebration quilts, using materials and artifacts to commemorate an event or a person’s life. So many of the quilters I talk with want to make personal and original memory quilts. I teach this class locally and I travel to teach it at shows and guilds. It’s important to me to help quilters gain the confidence and skills they need to commemorate in quilts what’s important to them in life. In this class, I show examples of memory quilts, walk students through the worksheet from my book on memory and celebration quilts, and brainstorm with them to inspire ideas and overcome potential roadblocks. Everyone gets a chance to share their ideas and ask questions. Students arrive with a topic and leave with ideas, suggestions, and a path to follow. Friday, November 1, 11am-noon, event number 549. I love adding text as graphic elements in my work and I’m gratified that this has been identified as a trend in the art quilt world. 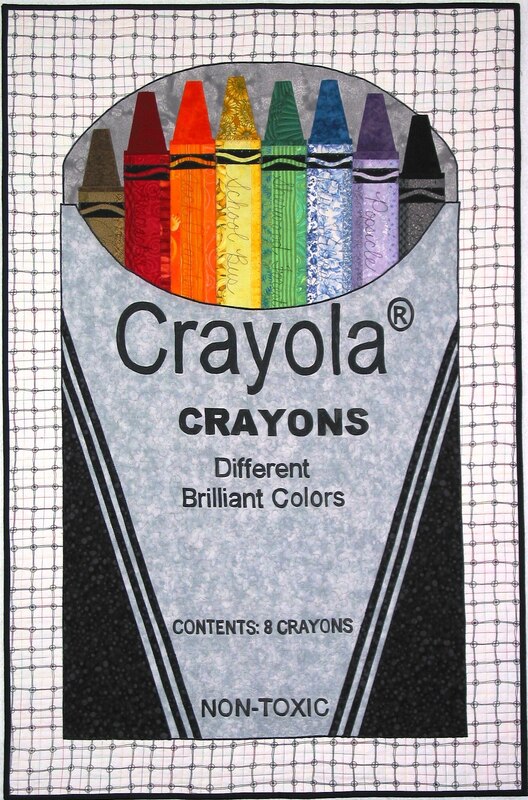 I believe the writing on your quilts should not be confined to your labels. In this lecture, I share lots of examples of adding text using your sewing machine, paint, ink, and beads. The possibilities are endless! Friday, November 1, 2:30-3pm and Saturday, November 2, 1:30-2pm. The show organizers invite teachers to present a half-hour presentation to help us connect with show visitors. 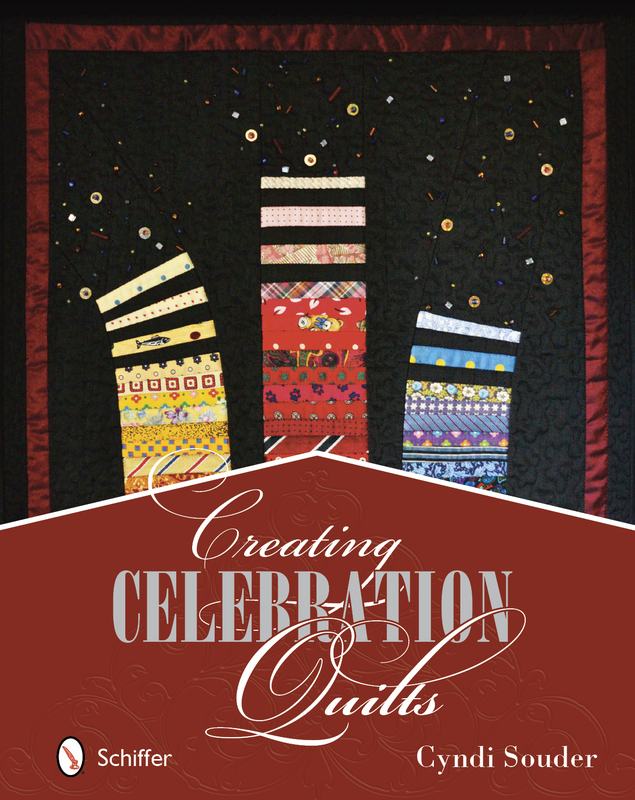 I’ll be there sharing my book, Creating Celebration Quilts, and talking about making memory and celebration quilts. If you miss this class on Thursday, this will give you an overview of how to get started on your own memory quilts. No tickets required; this is a free event. Saturday, November 2, 4-6pm and Sunday, November 3, noon to 2pm. While I love using commercially available fabrics, it’s fun and gratifying to create my own fabric with paint and stamps. In these free demos, I’ll show how easy it is to create your own fabric using some paint and the wonderful wooden printing blocks from Colouricious (available from Artistic Artifacts online, at the store in Alexandria, Virginia, or at the show). These versatile blocks can be used for stamping, for rubbing as a texture plate, and for display. LOVE them. No tickets required; this is a free event.